Small businesses, by definition, are lean. With a price tag that includes license renewals, maintenance and upgrades to servers and IT support, the costs of adopting enterprise-grade software and services has been prohibitive for most SMBs, posing a potential threat to delicate profit margins. More recently, however, thanks to increasing access to broadband, the proliferation of connected mobile devices, and the rise of cloud services, this has begun to change. Today, with access to the cloud and affordable SaaS-based solutions fast increasing, small businesses are adopting the kind of services and tools that were once reserved for their enterprise counterparts in droves. It’s happening across the board, from business apps, securitya and CRM to BI, accounting and telecommunications. Y Combinator -backed Weave is one of a growing set of companies looking to capitalize on this trend and bring modern software and services to the millions of small businesses that have traditionally been underserved by big players. Launching officially today, Weave is on a mission to help small and medium-sized businesses upgrade their telecom systems and connect the many disparate services they use in day-to-day operations under one roof. 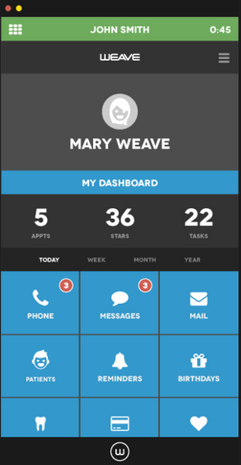 Dubbing itself a “new kind of phone company,” Weave’s software integrates with the existing CRM systems used by small businesses — particularly dentists, accountants and chiropractors — and provides access to voice, SMS and email services within one package and interface. Communication is critical to small businesses and small practices, as customers today have increasingly high expectations when it comes to support. For small businesses, creating fluid communication lines are part of offering that extra level of support that can increase loyalty and become the difference between gaining a customer or losing one. For businesses that revolve around the phone, like dental practices for example, it’s the little stuff. They want to know who their customers are when they call, they want access to communication histories, and they need to be able to quickly and effectively communicate with them, market to them and offer support at any time. This is where Weave comes in, as it aims to provide small businesses with the kind of tools they need to offer this level of support in less time and without training. Because founders Brandon Rodman, Jared Rodman, and Clint Berry have prior experience in the market and because it happens to be one that has been ignored by enterprise vendors, since launch, Weave has primarily focused on serving small and medium-sized dental practices. While it may sound like an odd vertical to start with for a technology company, there are 160,000 dentists in the U.S. alone, and judging by the interest in the early going, better telecommunication services are in high demand. At launch, Weave has already attracted over 200 paying customers and, according to its founders, has been growing at 10 percent each week. To support this early growth, the startup has raised over $750K in seed funding from Y Combinator, the YC VC fund and friends and family. While Weave was built with dentists in mind, the platform has been designed to be modular and the startup plans to expand into other verticals in the coming months. From the start, Weave’s appeal to dentists has been that it allows practices to upgrade their phone service without the headache. They can transfer their existing numbers to Weave and cancel service with other providers in minutes, while getting access to a system that allows them to integrate telecom features with their practice management software. Again, while quick integration with the major practice management software providers has limited value outside of dentistry, the founders think that Weave’s modular foundation, VoIP service, SMS and email integration — along with the minimal legwork required to get compatible and sync with existing systems in other verticals — gives it appeal beyond its initial market. The founders also tell us that Weave’s PBX-based software is set up such that all phone calls travel across its servers and, since it integrates with a practice’s software, the system is able to offer key information about that caller. After identifying the incoming call, for example, Weave can quickly parse practice data to determine if someone in the caller’s family has an appointment already scheduled, if there are family members overdue that need to be scheduled, does anyone owe money or are past due on their balance, have a birthday coming up and so on. Traditionally, pulling up this range of information would require a lot of time and clicks on the part of dentists (or any small business for that matter). While Weave offers features two-way text messaging, which enables users to text back and forth with their patients as they would on their smartphones, for now, the service is limited to the desktop. However, the startup has a native mobile app in its near-term plans, and because Weave’s interface is designed in such a way that it looks more like a mobile UI than desktop, the founders believe the transition won’t be difficult. The one feature of Weave’s system that could present friction depending on the practice is that it’s not just compatible with any old phone. Its technology requires users to buy particular phones, which are specifically programmed to work with its system and support HD voice and unlimited lines. However, Rodman says that the team has found thus far that many dentists are looking to upgrade their hardware as well, and because they have a partnership worked out with a phone vendor, they can offer the phones at a discount. While telecommunications software and systems for dentistry isn’t exactly the sexiest formula out there, Weave’s growth indicates that it’s managed to tap into the growing demand among small businesses and practices for more modern, enterprise-level products. The “unsexy” industries are often where demand is highest, and pulchritudinous or not, creating solutions that tackle the tough problems in those industries can mean big business.